The Awataguchi School (粟田口) was founded by Kuniie (国家), whose father Kuniyoshi (国吉) went to Kyoto from Yamato Province where he had connections with Kofukuji Temple. Kuniie (国家) founded the school in the Awataguchi (粟田口) district of Kyoto near the Seirenin Temple. It is estimated that this occurred around the early 1100’s. This school flourished from the early to mid Kamakura period. Kuniie (国家) had five brothers, Kunitomo (国友), Hisakuni (久国), Kuniyasu (国安), Kunikiyo (国清), Arikuni (有国), and Kunitsuna (国綱). Kunitomo’s(国友) son, Norikuni (則国), and his grandsons, Kuniyoshi (国吉) and Kunimitsu (国光) together with Kuniyoshi’s (国吉) son, Toshiro Yoshimitsu (吉光) continued the school traditions. 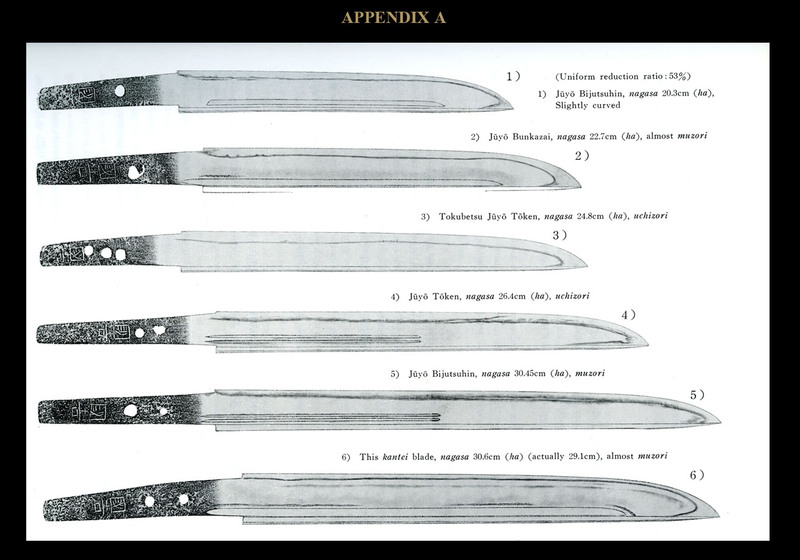 While relatively few tachi remain from these smiths surviving tanto are much more numerous. Awataguchi Kuniyoshi (粟田口国吉) was the son of Norikuni (則国) and is said to have been the father of Toshiro Yoshimitsu (吉光). He was given the title of Sahei-no-jo (左兵衛尉) and is thus known as Sahei-no-jo-Kuniyoshi (左兵衛尉国吉). His active period in history can be known from his dated examples that range from 1280 to 1287. Kuniyoshi (国吉)　was known for tantô in various shapes including the ones in wide and long measurements. 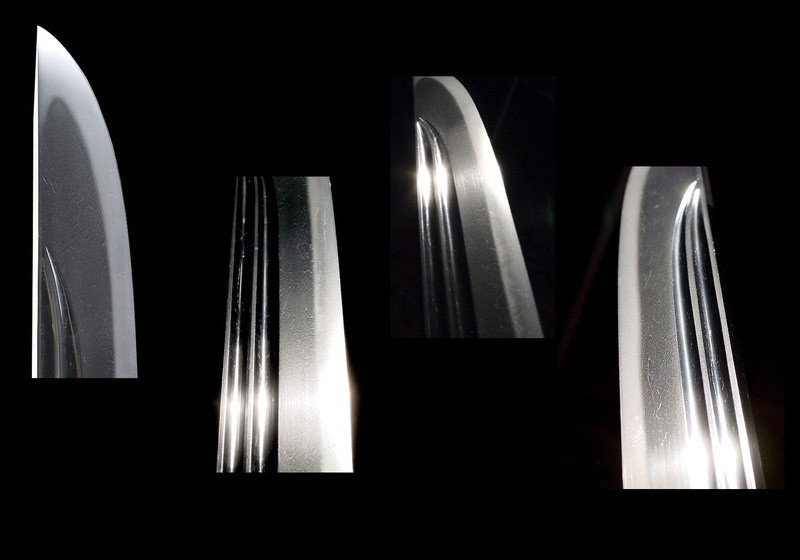 They are wide but in sun–zumari length (squeezed length) making the blade look like a Japanese kitchen knife or hocho. He made others in markedly smaller sizes. The variety of shapes of his tanto is what differentiates his works from tanto produced by the Rai School. This variety of shapes was passed on to his son, Yoshimitsu (吉光). SUGATA: As noted, he produced tantô in a variety of shapes. They ranged from markedly small to others that were especially wide. He made some wide and relatively short while others were short and pronouncedly long. There is only one known signed tachi by Kuniyoshi. It is a Juyo Bunkasai. Although suriage, it is shinogi–zukuri with a squeezed medium kissaki. 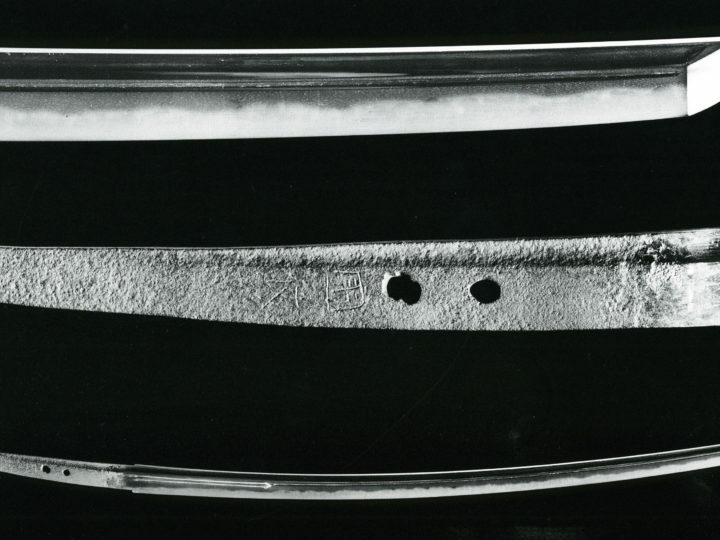 It has a high kasagi–zori that occurs when the center of the curvature is placed in the middle of the blade length. 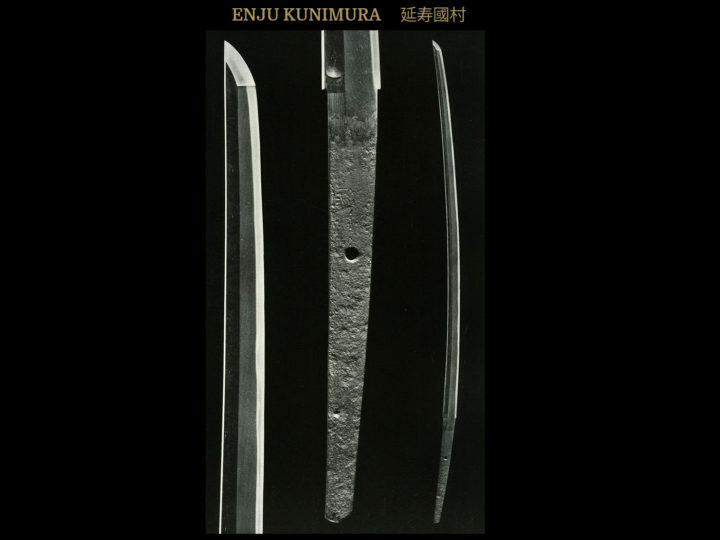 JITETSU: Kuniyoshi’s kitae is ko–itame mixed with small mokume consisting of fine grain formations that indicate a thorough forging operation. 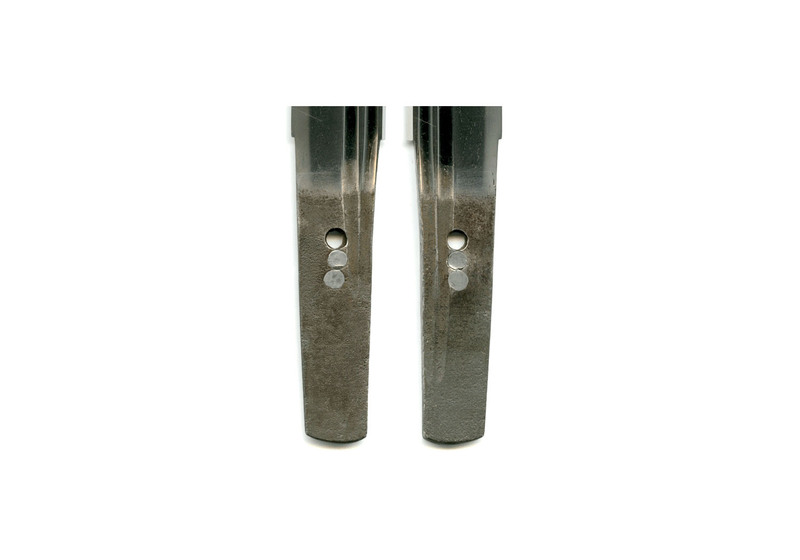 The jigane also has a different kind of tightness in that the ji–nie are more outstanding making the grain clearly visible. This is the so-called nashiji–hada characteristic of the Awataguchi School. The fine and thick jinie makes the ji–hada especially attractive. It is not uncommon to find ji–utsuri near the mune of his blades. HAMON: Suguba–hotsure is the most common. This means that the suguha is mixed with ko–choji midare or occasionally a rather wide suguha choji–midare, with nie. The nioi line is wide and there are ashi, occasionally there is ni–juba. BÔSHI: The nie in the bôshi are rougher than those in the hamon. The bôshi is ko–maru, and occasionally o–maru, with a short kaeri. yakitsuma, nie kuzure, and kaen are also seen. NAKAGO: Awataguchi tachi nakago are long and slender. They feature sori and hira–niku, as well as a slightly curved, but flat surface. 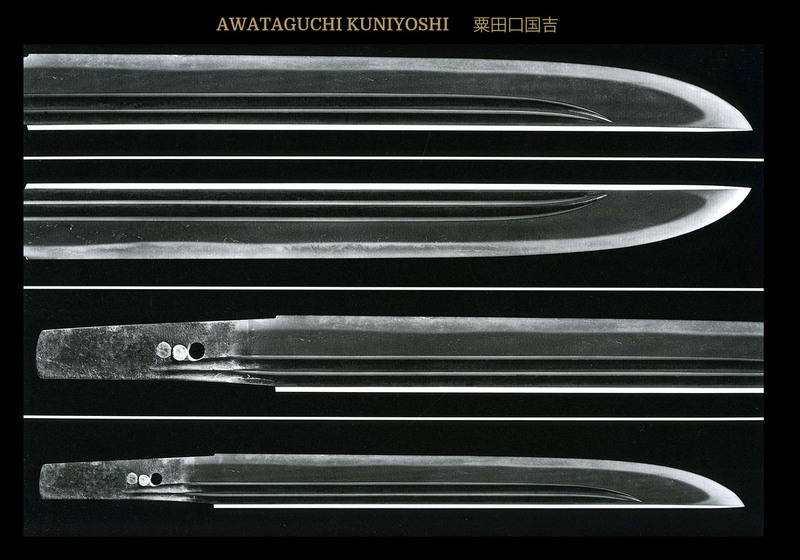 The tanto can take either of two nakago shapes, one without sori, and the other a furisode nakago. The nakagosaki is a shallow kurijiri. MEI: Signatures generally consist of two characters. Kuniyoshi has one tanto with the naga–mei, Saheino-jo Fujiwara Kuniyoshi. HORIMONO: Bo–hi, soe-hi, koshibi, and ken are the usual horimono seen with this school. Bo-hi are quite common. The top of the hi is close to the ko-shinogi line and resembles a straight line rather than a rounded shape. The bottom groove is usually stopped with a kaku-dome, kaki-nagashi, or kaki–toshi. In tanto, simple horimono like suken, bonji, and goma-hashi can be seen. Characteristic of the Awataguchi school is that gome-hashi are carved near the mune. Often when it comes to Japanese swords, the pattern of horimono is different on either side, but in this school the same pattern is engraved on both sides. Designated Tokubetsu Juyo Token at the 18th shinsa held on the 12th of March 2004. 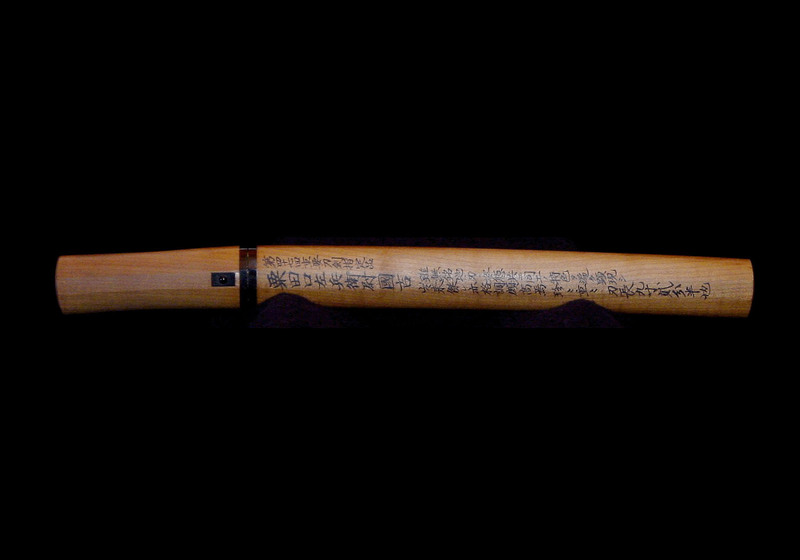 Horimono: Two lines of Kakinagashi bo-hi are carved on the both sides of the blade. Jitetsu: Small itame-hada contains mokume. Jinie and chikei combine to make incomparable beauty. Hamon: Suguha-hamon with deep nioikuchi. Niju(double)-ba and Sanju (triple)-ba appear on the hamon. Boshi: The temperline turns back in a large round manner.